Despite recent surveys that most workers in the U.K. fail to take a lunch break or have the same thing every day. We do take a break and would like others to do the same not only at the weekends. Ours is a low brow and cheap version with variety being the key. So we encourage everyone to try Station Road Brixton as it is now a lunch destination that changes daily. Different styles and countries sit side by side and there is always a choice, even on Monday. You can have a takeout or eat alfresco on the chairs and tables scattered around in the street. 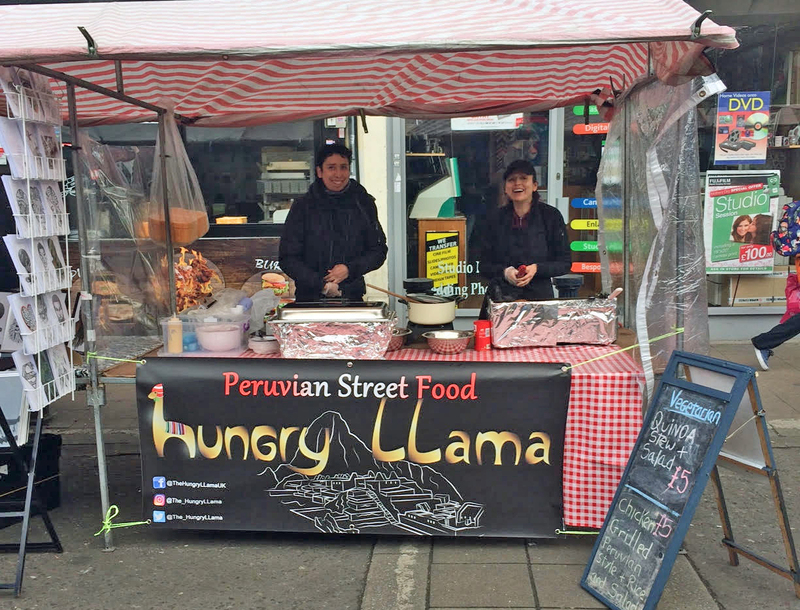 This Peruvian stall is a new addition to the food outlets and we tried it on Saturday after the gym. The menu is simple – only two things, one veggie, one meat. Veggie was Quinoa stew and salad, the meat was chicken and rice. But the chefs thought the rice was “too strong” and they were not prepared to serve it. So, on this occasion, I had a mixture – chicken, quinoa and the salad. A large enough portion and plenty of reward for a couple of hours in the gym (well maybe it was only 45 minutes but I was counting every one). Quinoa tends to divide our family, a bit like marmite. This version was served in a tomato sauce with extra potato and was more than palatable. I turned down the chilli sauce but that was probably a mistake – I’ll know next time. The salad was a mixture of beetroot, tomato, potato and red onion. 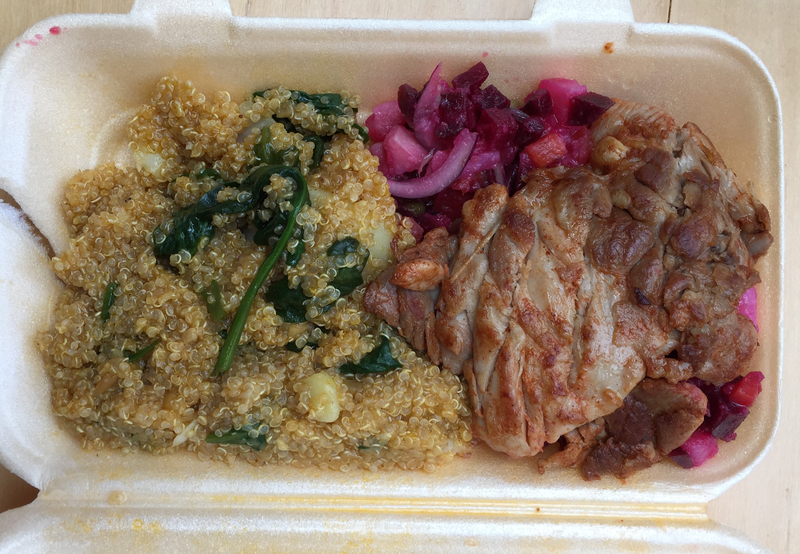 So it was mainly sweet with an occasional bite of onion – not unpleasant and definitely a foil for the quinoa. The chicken was cooked on a griddle and covered with a subtle but tasty marinade. It was delicious and I would definitely order it again but perhaps without quinoa. The best part is the cost – £5 for one of the usual combinations and because I had a mixture, it was a bargain at £6.